In this IBM® Redbooks publication, we discuss the concepts, differences, and migration paths that you must understand before you attempt to migrate the artifacts that you created using the IBM WebSphere® Studio Application Developer Integration Edition 5.1 product to the IBM WebSphere Integration Developer 6.0.2. We also include a discussion on how to migrate models that are developed in WebSphere Business Integration Modeler 5.1 to WebSphere Business Modeler 6.0.2. 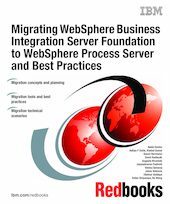 In this book, we provide guidance on how to migrate the processes that are installed and running in WebSphere Business Integration Server Foundation to the new integration platform. We also tell you how to bring your components and artifacts to this new generation of integration paradigm. Part 2, "Migration procedure" on page 51 provides detailed steps that are required for migration and includes the tools that are available, the artifacts that are involved, and best practices. In this section, we also demonstrate the migration process using practical migration scenarios that cover most of WebSphere Business Integration Server Foundation capabilities, which includes process choreography, human activities and staff assignment, and exception and error handling.